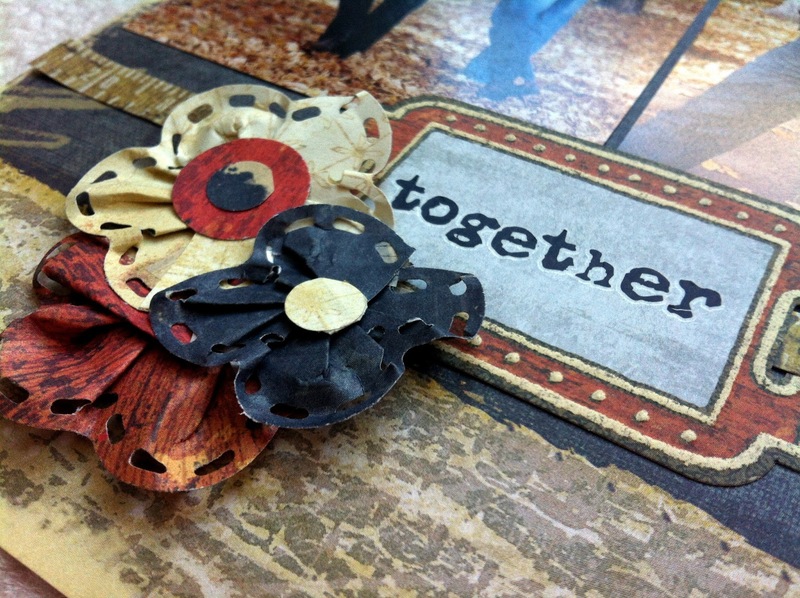 I have a new layout up over at Scrap It With A Song today to share with you! February is all about love songs at SIWAS and this week the Rock Chicks were challenged to use "We Belong" by Pat Benatar as our inspiration! As a teen in the 80's I loved Pat Benatar (she was so cool!) and this song was always a favorite at dances as it seemed to capture the intensity of feeling we had for our high school romances! I used some pics of Shane and I (from 5 years ago!) with the refrain from the song - "We Belong Together" - as the title. I used papers, tags, sticker letters and paper ribbon from Creative Memories "Rugged" Power Palette (retired) for this layout to complement the outdoor setting of the photos. But since there are no flower accents in this Power Palette, I thought I might try my hand at making some. I'm glad I did, because I love the way the ruffly flowers contrast with the masculine papers and textures! The flowers were made by folding a scalloped border back onto it's centre and attaching some punched circles to hold the folds together. Here's a mini-tutorial for you. 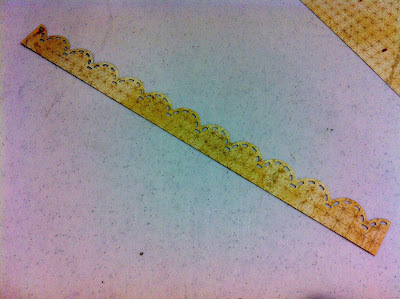 1) Punch a 12" border using the Border Maker and the Scallop Stitch Cartridge. 2) Hold one end in your left hand, and with your right hand fold the next segment of the scallop shape foward on a diagonal. The top edge of the border will start to curve into a rounded petal shape. Pinch the folds together with your left hand, and continue folding the scallops back onto themselves with your right hand. 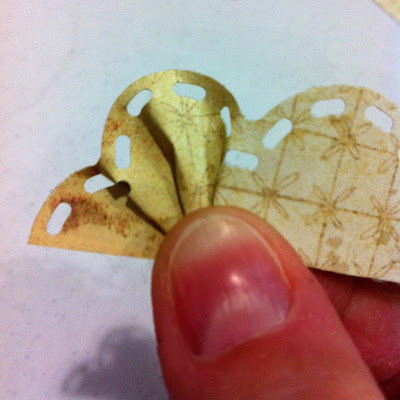 3) Once you have completed a circle, trim off any remaining border on an angle and use a dab of adhesive or a glue dot to hold the first and last edges together, lining up the scalloped edges if you can to form the last petal. 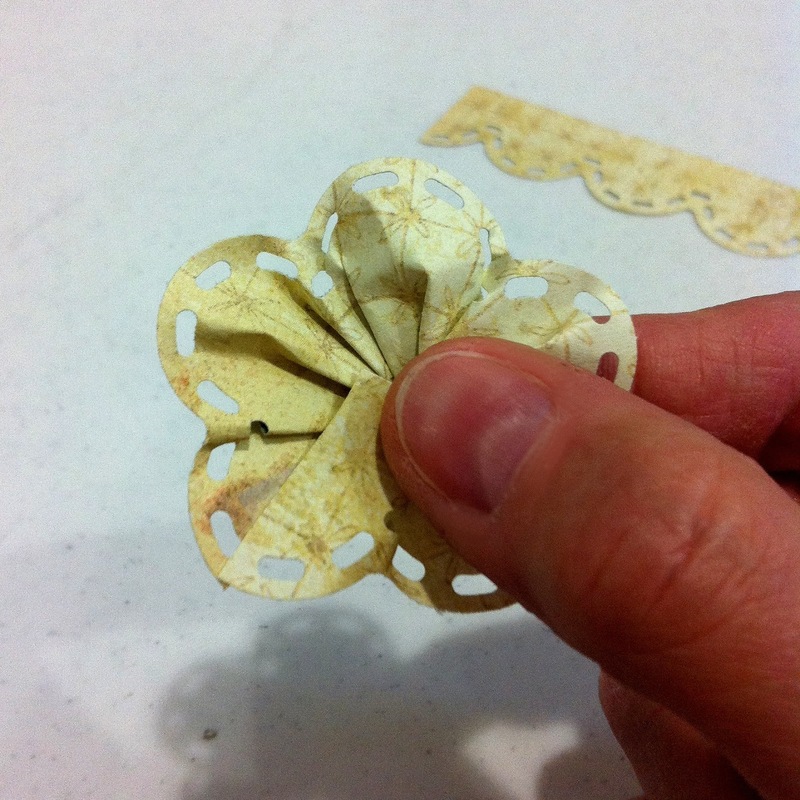 4) Circles are the magic that will hold these flowers folds together. I used a 1" circle punched from scrap paper as the base. I covered it with adhesive and pressed the flower down onto it. I added a smaller 3/4" circle to the top of the flower in the same way. This top circle also acts as the centre of the flower. On the bigger flowers I layered another 1/2" punched circle on top for decoration only. I hope you get a chance to try this easy and fun technique on a layout or card soon. Don't forget to pop over to Scrap It With a Song to see all the fabulous Design Team Layouts and add your own take on any of this months' song challenges! Love this layout Noreen!! Gorgeous - and the flowers are great too! First Design Team Layout for SIWAS!